☆ Location(s): Ikebukuro (Tokyo), Shijō Kawaramachi (Kyoto), Fukuoka, Sendai, Yokohama, Akihabara (Tokyo), & Nagoya. Mob Psycho 100 (モブサイコ100) will be having a limited-time pop up collaboration café in commemoration of Mob Psycho 100 II which is the second season that begun airing earlier this year. The collaboration will be held with multiple Sweets Paradise shops for a limited time on various dates of 2/27/19 - 4/21/19. Collaboration dates will vary from store to store so be sure to double check the dates before visiting. A specially designed menu, original goods, and more will be available for fans to enjoy for a limited time! Goods shop will only be available to be used by customers who order off of the collaboration menu. Sweets Paradise (スイーツパラダイス) is an all-you-can-eat sweets buffet. When visiting a sweets paradise collaboration location you will need to pay for the standard buffet fee which allows you to eat from their buffet which consists of the drink bar, gelato, & Häagen-Dazs for ¥1,500. To order a collaboration set is an additional ¥700 which includes 1 collaboration food or dessert and 1 collaboration drink. Additional orders are ¥500. The Yodobashi Akiba Cake Shop location (ケーキショップヨドバシAkiba店) is a take-out only location and will not have a full menu or a place to sit down and eat. Nagoya CoLaBoNo Cafe (名古屋CoLaBoNoカフェ) is not an all-you-can-eat sweets buffet location and will have a different menu and will not require the ¥1,500 buffet charge. It is possible to call in a reservation or apply online via Sweets Paradise app available in Apple Store & Google Play. You may find the app in international app stores however the app is in Japanese. Generally a reservation is not needed to visit Sweets Paradise however if they are full at the time of visiting you will not be seated. The total for paying for the buffet fee and collaboration set (1 collaboration food + 1 collaboration drink) is ¥2,200 + any additional orders at ¥500 per order. Customers who order the collaboration set will receive an original business card as novelty from target stores in addition to a drink coaster (1 out of 14 designs) at random. An additional coaster will be given per additional order. While supplies last. Customers who spend ¥2,000 or more on exclusive goods & merchandise from the shop will receive an original postcard (1 out of 5 designs) at random per ¥2,000 spent while supplies last. This does not include money spent on café food. Goods/merchandise only. Café exclusive goods are available for purchase by customers who order off of the Mob Psycho 100 collaboration menu. 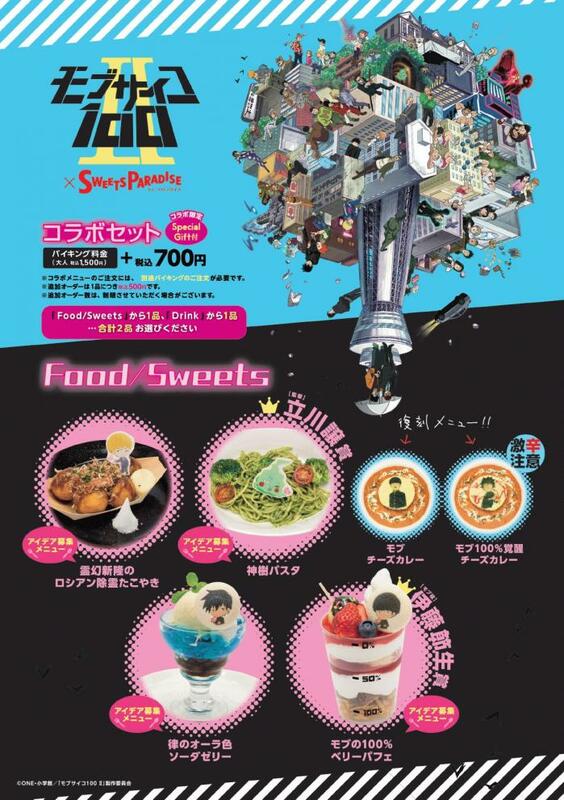 Customers who visit a participating Sweets Paradise location and does not order off of the collaboration menu will not be eligible to purchase goods. The merchandise offered will be split into two phases. So please be mindful that your selection of goods is based on when you visit. This collaboration will be held at 7 location(s) around Japan. Please be sure to verify the date, time, location, and reservation status of the café closest to you before visiting as these details may differ from location! *TAKE OUT ONLY! No seating available.